Image Size: 26 X 24 in. "I believe that art can be more than just pretty pictures. Art should bring comfort to people. It should be by our side when we go through good times and hard times," says Steve Hanks. "Art should elicit a thought-provoking examination of one's own life and place in the world." "We all experience pain, but there are great moments of pleasure all around us too. These moments may often be fleeting and get by us before we are able to fully comprehend their beauty and importance. I have tried to capture a few of these moments in paintings that can be savored for years to come." The beauty of this joyful moment is infectious. 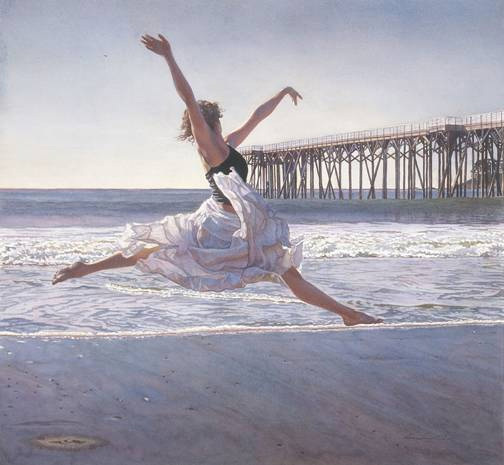 Steve Hanks has succeeded in capturing that perfect, uplifting energy in To Dance Before the Sea and Sky.